South China Sea nations take notice: the world’s largest Landing Craft Air Cushion (LCAC) reached Guangzhou this month. Amid simmering tensions in East Asia over a series of sovereignty disputes at sea, where new, unpredictable bouts of escalation are always around the corner, China has continued to build up the capabilities it will need should it one day decide to use force. The latest addition to its growing arsenal — the world’s largest Landing Craft Air Cushion (LCAC) vehicle — reached Guangzhou earlier this month, and could enter service soon. The vehicle in question, a Ukraine-built “Zubr” amphibious hovercraft (also known as the “European bison”), is part of a US$315 million deal signed between China and the state-owned Ukroboronprom defense conglomerate in 2009. Under the agreement, two LCACs, developed by the Ukrainian Almaz Central Marine Design Bureau, are to be built by the Ukraine-based Feodosia Shipbuilding Company, and two more by Chinese shipyards, under the supervision of Ukrainian engineers. 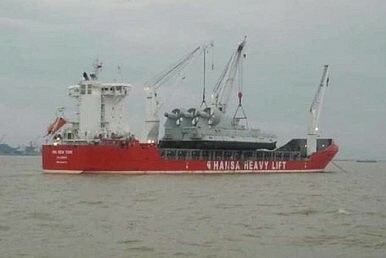 The first vehicle, which was handed over to the PLAN during a ceremony last month, arrived in Guangzhou — likely at Guangzhou-Huangpu Shipbuilding Co — where it was presumably fitted with additional electronics and weapons systems on May 24. A second one is currently under construction at Feodosia. Nearly four-stories-high, the 555-ton LCAC could be a game-changer in amphibious operations within the region. The data sheet speaks for itself. According to various sources, the Zubr has a range of 300 nautical miles (555 km), can remain at sea for five days before replenishment, and can travel at up to 60 knots (55 knots for sustained cruising). Its payload capacity, at approximately 150 tons, is more than twice that of the LCACs in service in the U.S. and Japanese military, meaning that it can carry the equivalent of three main battle tanks (e.g., Type-80); 10 armored vehicles (e.g., BMP-2); 10 armored personnel carriers (e.g., BTR-70); or eight amphibious tanks. Meanwhile, its four compartments can accommodate 140 troops, or over 350 without armor. Furthermore, compared with U.S. or other equivalents, the Zubr is armed to the teeth. Its standard configuration includes two MS-227 launchers for 140 mm unguided rockets, two AK-630 30 mm close-in weapons systems (CIWS), Igla-1M air-defense systems, as well as mine-laying capability (between 20 and 80 mines, depending on the configuration). Such firepower means that aside from carrying out over-the-beach landing of troops and combat materiel, the Zubr can also provide fire support during operations ashore. While defense analysts speculate that the LCAC could play an important role in amphibious operations against Taiwan’s outlying islands, such as Kinmen and Matsu, a more immediate concern involves contingencies in the South China Sea, where China is embroiled in various disputes with the Philippines and Vietnam, as well as Malaysia, Brunei, Indonesia, and Taiwan. It is not yet known whether all four LCACs will join the PLAN’s Southern Fleet, or whether China intends to acquire or build more. But the South China Sea is where the Zubr would be at its most effective, given that regional navies (with the exception of Taiwan) are ill equipped to deal effectively with it, not to mention the fact that the area provides an environment that is suitable for this type of hovering vehicle. LCACs can usually navigate over 70 percent of coastal landing environments — including marshes and beaches — against only 15 percent for traditional landing craft.